The exterior of Maxim's today. Restaurateur Brendan Sodikoff made news recently by announcing he purchased the old Maxim’s space on Goethe Street from the City of Chicago. Sodikoff said he plans to restore the restaurant to its glory days of the &apos;60s and &apos;70s when it reigned supreme in Chicago’s culinary landscape. But even Rick Kogan, who hosted a live show in the Maxim’s space in recent years, only has a few memories of its glory days: cocktails with co-workers after the Chicago Daily News folded and a New Year&apos;s Eve in his twenties. That’s most of what Chicagoans know of Maxim’s at this point (if this is not true of you, please share some stories in the comments). That and the fact that its interior is an exact replica of the legendary Parisian establishment. But shouldn&apos;t Chicago&apos;s food fans know a little more about the place that put the Midwest on the culinary map? Maxim&apos;s opening made it was a fixture of the society pages in 1963. In 1982 there was an extensive history of Maxim’s published by the Chicago Reader. That was around the time Nancy Goldberg sold the restaurant after a 19-year run, most of that as the indisputable pinnacle of Chicago’s restaurant scene. Ironically, everything but the spiral staircase entryway was subterranean. 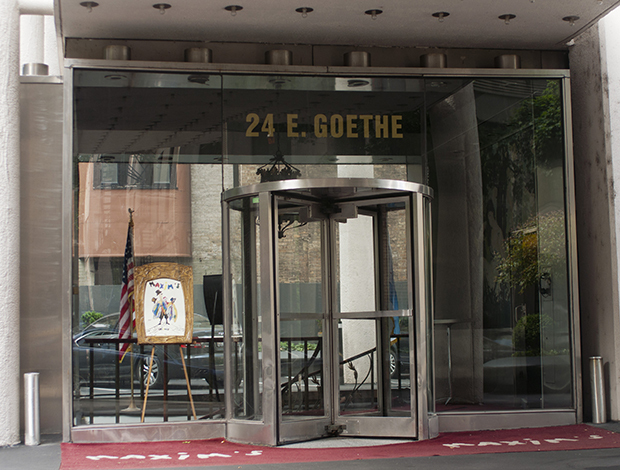 In the &apos;80s a few restaurantuers attempted new concepts in 24 East Goethe, but none lasted more than two years. Goldberg wound up using the space for special occassions and events before her death in 1996. When Goldberg&apos;s children couldn&apos;t decide what to do with the space after her death, they gave it to the city. Under Lois Weisberg, the Chicago Department of Cultural Affairs published the Reader article as a brochure. The massive PDF file was available for download on the city’s tourism website as well as the city-maintained maximschicago.org. Unfortunately consolidation of city departments (or the space&apos;s recent auction) seems to have let Maxim’s website fall through the cracks. That’s a shame because Don Rose paints an exhaustive and exquisite picture of Maxim’s in the Reader piece. Many of the details and anecdotes about Maxim&apos;s only exist in Rose&apos;s story. For instance the discoteque that opened in a side room in Maxim’s in 1965 was Chicago’s first. Yet searching for “Disc de Maxim’s” only returns one Google result. Rose, however, shares juicy details like the 200 records handpicked by a Parisian discotheque queen named Regine and the rules under which the 1,000 exclusive members were governed. More important for modern Chicago diners wondering what Sodikoff might have up his sleeve, Rose describes Maxim’s food in great detail. And though the restaurant was considered haute cuisine, many of the dishes sound like the spiritual ancestors to current offerings from Longman and Eagle or Girl and the Goat. Bone marrow, foie gras, sweetbreads and kidneys were all commonly found on Maxim’s menu. Maxim’s is inextricably linked to Chicago’s culinary landscape. Most French restaurants in the area were either founded by a Maxim’s chef or had one pass through at some point. Kiki of Kiki&apos;s Bistro moved to the country to work as Maxim&apos;s first sommelier. If anyone is a fitting champion of Maxim&apos;s legacy, it&apos;s Brendan Sodikoff. His restaurants focus on French cuisine served in opulent settings with an element of wistful nostalgia. Perhaps it was the success of his first restaurant, Gilt Bar, that gave Sodikoff the idea to recreate Maxim&apos;s. Gilt Bar&apos;s location, 230 West Kinzie, saw restaurant after restaurant fail following a fire in 1986 that shut down a popular place called George&apos;s. That fire also brought an end to another effort of restauranteur (George Badonsky) to revive Maxim&apos;s.
Perhaps Sodikoff can make Maxim’s stick as well. Andrew Gill is a web producer for WBEZ. Follow him on Twitter or Google+.